I recently watched this video from the « Forum for the Future of Democracy » which goal was to define democratic process and here are some explanations. It is a very cheap, very accessible way to enhance participation, to show politicians work, to give more realtime information of better quality and to enlight choices. e-Democracy will allow -if we allow e-democracy to emerge- to give people real power. Indeed, people are usually interested in democracy but they are often out of touch and they lack information.Therefore there is an imperative need to rally citizens and spread informations. The primary obligation of a democratic state is to ensure that lack of access to new technologies does not become a social divide as illiteracy once was. e-Democracy is creating new ways to engage in democracy: electronic vote, forums, collaborative platforms, etc. These online tools allow citizens to interact, participate and collaborate. By talking directly to the people, government’s messages won’t have to be transmitted to a third party lile media to spread the word. Citizens become media. There is by fact a gap between electronic haves and electronic havenots. It is a reality and a threat to democracy and inclusion. Governments should not wait for citizens to come to them but they should engage and go to the crowd. Citizens need to trust governments and governments need to trust citizens. Let’s interact, let’s share, let’s collaborate but let’s do that all together. There is a gap between old and younger generation in the use of technologies. When youngers are usually more at ease, a real work should be made on seniors use. In order to fight digital divide, we also need to improve youth involvment by teaching from the bottom. To be efficient, e-democracy classes should be given as early as kindergarden. In this newtech world, if we want to avoid the creation of a new barreer between people and administrations, we have to engage every citizens to join the move. *For french readers, french translation of illetrism would be « analphabetisme », not « illetrisme ». All of these websites make simpler access to still complicated informations -not mentioning the re-looking need. But hey, french Data Publica to be opened in 2011. When the US “data.gov” (or the newborn data.gov.uk) leads to increase the emergence of new services, France approach leads to increase the yet emerged “bureaucracy”. A new website dedicated to making non-personal data held by the U.K. government available for software developers has launched: Data.gov.uk. As a reminder, Data.gov is the U.S. platform presenting and making available governmental data for all. It was launched after Obama’s directive on Open Governement in 2009 and its purpose is to increase public access to high value machine readable datasets. It offers searchable catalogs that provide access to “raw” datasets and various tools in such formats as XML, Text/CSV, KML/KMZ, Feeds, XLS, or ESRI Shapefile. A catalog of tools links users to sites that offer data mining and extraction tools and widgets. Now what’s new with data.gov.uk ? – Integrating ONS data with http://www.data.gov.uk/ from January 2010. Early comments are positive, when comparing UK gov to its counterpartUS Data.gov. The U.S. version pales in comparison as it’s missing the user-friendly approach. Also, when the U.S. government’s Data.gov site launched, critics pointed out that it was filled with relatively non-controversial data sets, plenty of USGS data but no DOJ or military data. The U.K.’s data site, in contrast, includes 22 military data sets at launch, including one called Suicide and Open Verdict Deaths in the U.K. Regular Armed Forces. The national data.gov are also complemented with local platforms such as: Washington D.C, City of New York, San Francisco, State of Utah, State of Michigan… England is following the same path as London launched its own platform too. What about French ? Can they ? There won’t be any data.gov.fr in France… But there is a national platform in process. Data Publica is one of the lead projects of NKM call for proposal “Web 2.0”. This project aims to create a national website where public and private actors could publish their API, metadata and licence. This project is being developped by Araok!, Nexedi and Talend and shoud be launched by 2011. Notice that local non-profit groups are also emerging to incite cities to open their datas before that date and liberTIC is one of them. European Directive Inspire is one of the most important legislative tools for the “opendata-believers” in the European Union. Specially if you are lacking an active national opendata program. Here below is a first approach and basic introduction to understand why. The United Nations E-Government Development Knowledge Base (UNKB) is a benchmarking tool that provides a comparative assessment for monitoring progress of a country’s E-Government Development from 2003 to 2010. As such it provides an interactive snapshot picture of a country’s E-Government Development in the world. The results of 2008 Survey indicated that governments were moving forward in e-government development around the world. However, given the high demands, progress was slow. In terms of citizen engagement, the e-participation index indicated a modest upward movement with 189 countries online in 2008 as compared with 179 in 2005. The United States scored the highest on the e-participation index. This was primarily due to its strength in e-information and e-consultation, which enabled its citizens to be more interactive with their government. It was closely followed by the Republic of Korea (0.9773), which performed extremely well in the e-consultation assessment, Denmark (0.9318) and France (0.9318) were tied for third place. In 2010, what changes ? You can find all results and datas for each index on the UN website. We’ll soon have more informations on this listing as the whole e-government survey for 2010 is about to be published. Here below is its table of content to be released. Sometimes, when identifying a case of failure in city infrastructure, people call the city’s general information number and sometimes they get transferred from one department to another only to give up. Now, mobile technology, real-time data capability, and social features have met to turn this frustrated notifier into an empowered citizen. CitySourced” is an example of this government 2.0 movement which point is to use technology such as social media and wireless communications to make governments more efficient in delivering services where they’re most needed. Most cities already have their own systems for sending reports to different departments but CitySourced has developed software that formats the data properly to work with those systems. “We provide a system that works with what they already have and charge a subscription fee” he says. Several cities in the US have developed similar efforts, most of them using the iPhone. One question comes up: Why pay a fee to a private firm for a service a city might develop itself ? The reports can also be a source of data used for other city services. A surge in graffiti in a neighborhood is often an early indicator of gang activity and can be used to alert police to bolster their patrols. Smartphones are surely great tools to make cities better places. But are all the cities able to use effectively great tools ? One unknown is how city service advisories are handled. Does this new service include new jobs or existing-job adaptation ? The second big unknown is how responsive the service can be and how will cities deal with new and fast upcoming feedbacks: more cleaning, more replacing, more work… less incomes ? 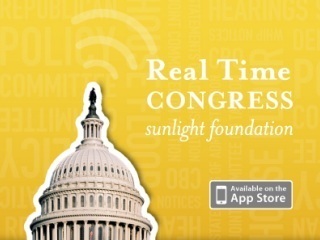 Real Time Congress is a fast and free app to access real-time information about U.S. Congress on iPhone. Lobbyists have spent lots of money to get access to real-time information on Congress, and it’s a divide that helped them be more powerful than most citizens. Now, the Sunlight Labs new Real Time Congress App put Congress informations into anyone’s hands all the time, making public empowerment real. Real Time Congress for the iPhone – and assimilated “Congress” for Android – are two examples of how powerful mobile applications can be in shifting the traditional balance of power. « We want to make data about what’s happening inside Congress more available to the public. It isn’t just who your member of Congress is that matters, but also what they do. It’s also important to see what they’re reading and who they’re listening to, and what the process looks like. Updates from the House and Senate floor as they happen. For now, all this information is displayed quite simply. There is no deep personalization, no search features and push notifications. Sunlight Labs will continue to improve on the app with user feedbacks. Still, this kind of app will definitely change the way citizens collect information about their government – and maybe how they are able to use that information to engage with government in new and more effective ways.